Shrewsbury's top-ranked defense will have its hands full with Grafton's top-ranked offense. 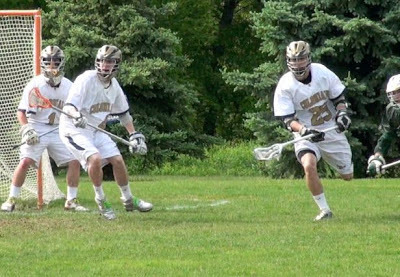 After beginning the postseason with 17 teams, only four squads remain in the Central Mass boys lacrosse tournament. Two teams from Shrewsbury are still alive, as top seeded St. John's looks to win its first Central Mass crown since 2010, while Shrewsbury is looking for its first CMass title ever. Also looking to take home its first title is Grafton, led by its pair of high-scoring senior All-Americans. Meanwhile, two-time defending champion Algonquin isn't ready to relinquish the region quite yet. The T-Hawks lead all teams with five Central Mass titles, one more than the four St. John's has won. Both semifinals will take place at Worcester's Foley Stadium Tuesday, and here is what to watch for. It wouldn't be a CMass tournament without these two getting together, and a new group of players is set to leave their imprint on the region's biggest rivalry. The Tomahawks have gotten the best of St. John's the last two years, coming from behind to defeat them in last year's semifinal and downing the Pioneers in overtime of the 2011 CMass final. Still, St. John's comes in as the favorite, boasting the best attack in Central Mass, led by All-American Hunter Burdick, junior Drew Smiley and senior Josh Freilich. The Pioneers have also enjoyed stellar play from junior middie Kevin Butler of late, and have gone from simply explosive to balanced and dangerous. It also bears mentioning that defenseman Aidan Fox may be playing better than any Pole in the region, and that goalie A.J. Arnold made several goal-robbing saves in the Pioneers' quarterfinal win over Westboro. The Pioneers won the only meeting between the two teams earlier this season at Assumption College, beating the T-Hawks 7-6 in overtime. Algonquin came closer than anybody in Central Mass to handing the Pioneers a loss, and did it with suffocating defense. Pole Brennan Pierce leads the Tomahawk defense, and All-American goalie Giles Ober has again been spectacular in net for Algonquin. The question for Algonquin will be if it can generate enough offense to keep up with the Pioneers. The returns of Jake Scearbo and Mike Woods from midseason injuries have provided a spark to the Tomahawk offense down the stretch, but the play of senior captain Keegan Gillis will be critical as well. The night game will see Grafton's pair of All-Americans try to find room against the stingy Shrewsbury defense. Senior attackman Tyler Reilly finished second in the region in scoring, but Grafton's offense runs through Bryan Rotatori. The phenomenal middie is as good a passer as there is in Central Mass, and his combination of strength and balance make him very hard to corral for opposing defenses. Grafton came up just short in last year's final against Algonquin, but the Indians may be even better this year. Reilly and Rotatori returned, but the Indian offense has improved thanks to contributions from Sawyer Coleman and Chase Kapuscienski. Last season, teams were able to get the best of Grafton when they shut down that great pair of All-Americans, but that is certainly not the case anymore. Shrewsbury also relies on a pair of stars in Cam Kerr and Luke Warner. The two seniors have been stabilizing forces for the Colonials as Shrewsbury has dealt with injuries all season long. Kerr takes face-offs for the Colonials, but is also a threat to score whenever he gets the ball. Warner was perfectly balanced offensively in 2013, scoring 31 goals and dishing out 31 assists. The Colonials will be looking for a measure of revenge, as it was Grafton that eliminated Shrewsbury in the quarterfinals a year ago. Last season, Shrewsbury leaned heavily on its defense, but an improved attack has the Colonials hopeful that they can keep up with Grafton's pace. But, Shrewsbury is still pretty darn good defensively. Goalie Chris Gorman enjoyed a breakout 2013, and the Colonials allowed the fewest goals in the region throughout the regular season at 5.09 per game. If you're wondering who had the highest-scoring offense this season, that would be Grafton. The Warriors scored 12.19 goals each time out.